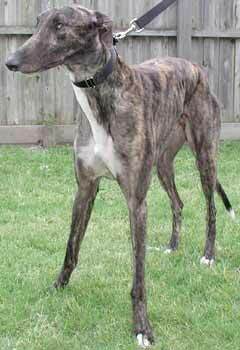 Marlow, aka Marlow McGraw, is a 2½-year-old dark brindle male, born December 15, 1999. His nickname growing up was "Big Puppy" because he was twice the size of his only littermate at the time of their birth. 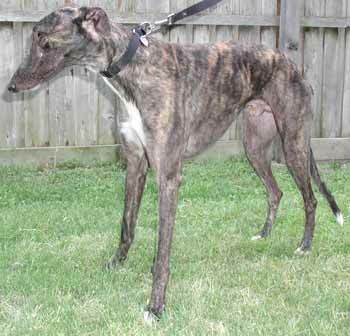 Marlow just wasn't fast enough at the racetrack, but that doesn't stop him from racing into your heart, given a chance! Marlow is adjusting in his foster home daily and learning about living inside the house; he is very, very friendly and loves attention and kisses. He is small animal safe.